We’re going to demystify the diabetic diet. So, we’ll be looking at eating healthy in general because, guess what, the diabetic diet is suitable for everyone in the family (unless you have other health or dietary problems). Let’s start with a really stupid question, why do we eat? We eat for nourishment and energy. Sometimes we eat for celebration, tradition, or just entertainment. But mostly, we eat to keep our bodies functioning well and that’s the main thing to remember when thinking about what to eat! The goal of a healthy diabetic diet is to provide nutrients and energy to the body while maintaining blood glucose levels as close to ideal as possible. Before we look at what to eat, you’ll need to know that while there are some principles of the diabetic diet that are pretty much universally agreed upon by doctors and nutritionists, there are others that are still somewhat controversial and the subject of research and debate. Let’s start with the easy stuff, first. Eat plenty of vegetables: For good carbohydrates, fibre, vitamins, minerals, anti-oxidants, cancer-fighting properties… They are like the trump cards! Eat a variety. Go for different colours, textures, and flavours. Always try the local, seasonal stuff. And include plenty of greens! Eat lentils, beans, and sprouts: For proteins and fibre. They help you feel full and aid in digestion. When well cooked they are comfort foods. And sprouted they add crunch. Ground up into flour or batter they can replace grains in baking. Eat a limited amount of fruits: For vitamins, minerals, fibre, and your sweet hit! Eat fresh, rather than in juices, or sugar-laden compotes, jams, and pies! Eat a small amount of nuts and seeds: For protein, healthy fats, and nutrients such as calcium. Nuts and seeds are concentrated nuggets of nutrients and healthy fats. However they are high in calories so eat them in small quantities and go for different kinds. Try them mixed into your salads, ground into butters, or just roasted as a quick snack. Use healthy fats: For vitamin absorption, nerve and immune health, cell development, and for heart health. Get them from nuts, seeds, avocados, olives, and oils such as olive, coconut, safflower etc. Avoid unhealthy fats: Saturated and trans fats (both solids at room temperature) tend to clog up your arteries and put you at risk for heart disease, which is even more dangerous if you have diabetes. Avoid refined grains, refined flours, and refined sugars: These have most of the nutrients stripped out of them, and because of the ease of absorption into the blood stream they are likely to spike your blood sugars for no corresponding benefit to your health! How much carbohydrates to eat: Most diet recommendations call for including some amount of whole grains in your diet. Whole grains contain fibre as well as nutrients that are good for your brain. They also help you feel full. What’s not clear is whether diabetics should aim to eat as little carbs as possible, or whether they can eat normal doses and regulate their insulin or medication to cover for it. Some people recommend a higher protein, lower carb diet while others say eat equal amounts of carbs and proteins. The important thing to note is that if you do eat carbohydrates, ensure you are eating them with the fibre and nutrients still in them – so go for whole grains, whole grain flours, and experiment with less known but nutritious grains such as millets. Whether to eat sweet things: While there is no debate that sugar, dates, maple syrup and other sweeteners spike blood glucose levels, it’s debated whether this means diabetics should totally avoid these products or should consume them in very limited quantities. If you do include these in your diet try to go for those which have nutritional benefits along with sweetness (jaggery has iron, dates have fibre). Whether to eat artificial sweeteners: It is also debated whether zero calorie sweeteners such as stevia and sucralose or low glycemic index products such as levulose should be used in desserts instead of regular sweeteners. Some of this debate is because these alternative sweeteners have not been around enough or tested thoroughly enough to be considered fully safe. However, some of the debate is based on manufacturers duping consumers by using these sweeteners and then labelling their products as diabetic friendly when they actually have a lot of refined flours, unhealthy fats, and other harmful ingredients. Eat freshly cooked, local, and seasonal: When possible, eat freshly made food that uses local and seasonal ingredients. This kind of food is likely to have retained the most nutrients and will also be suitable for the weather in your location. Eat raw, steamed, baked, stir fried, grilled, fermented: The idea is to use methods that keep the nutrients in, or in some cases unlock the nutrients from the food, while using only small quantities of healthy fat in the process. Eat often but smaller portion sizes: Until your system is re-tuned to understanding how much it needs to eat at each setting, try eating smaller portions and allowing time for your body to signal that the food is enough. Smaller portions also help with maintaining blood glucose levels. With Immediate Effect – From right now! De-link food from emotion, boredom, and reward. Take an interest and be aware of what you eat. Best Practices – Get into the habit! Eat fresh, home-cooked meals made with good quality ingredients. Experiment with different levels of carbs, measure your glucose, listen to your body, and adjust accordingly. Gradually build a collection of tasty, healthy recipes that work for you. Appreciate good food by savouring the tastes, smells, and sights. Try new foods, preferably made from locally grown produce. Cook for yourself once in a while and feed friends and family too! Diabetic Friendly Food Week Starts 22 November! Please do participate! Click here for details. Nice Article, very informative thanks for sharing. It is very important to be acquainted with diabetic diet especially to those individuals who are suffering from diabetes. I really learned a lot on your article on how to prepare healthy diet for such condition. Great post! Thanks Danica! Glad it was useful! The diabetic diet to me, seems to be one of the most ideal and healthiest diet for a long life right now. I used to be crazy about a low-fat, with less focus on my fructose(fruits) consumption but I now realize the importance to put a stopper on our sugar(including fruits and simple carbs)intake! Sugar, both fructose and glucose are highly addictive and we are only meant to be consuming them in moderate or little amounts, in addition sugar serves no function in our biological systems whatsoever, while fats are a vital part of our bodies. After all, our body is 70% fat. No just kidding haha. More like..20%?? Anyway, more posts to come about sugar, and the implications surrounding kids and their carbs intake. very informative post and i absoultely agree with your points on healthy eating. Hi there! I’ve been an supporter of the low-sugar diet for a while now, and I believe sugar can be more detrimental to your health than the ‘bad fats’. Have you heard of the arteries-clogging effects of sugar? There have been research linking high-sugar diets to heart diseases, etc. So all in all, sugar seems to be the real culprit in damaging our health via food. Hey, thanks for the links! Got my day’s reading set out! 🙂 If there’s more benefits to be had by following a low/no sugar diet then that’s great news. Seems like a diabetic-friendly diet is the way to go for all the family! It is! Although I’m still struggling with my fruits intakes, I must admit they really are addictive(sweetness)! Since learning about the fact that moderate to high cholesterol and fat seems to not have a lot of effects on the health cholesterol levels as numerous research have shown, I think it’s fairly safe to say diabetics now have more freedom in indulging in treat foods! 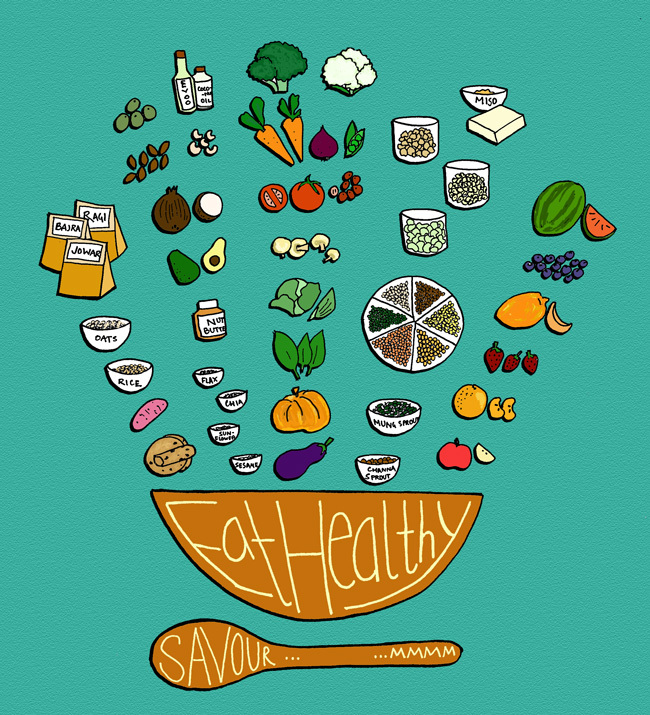 Still, fat has double the calories of other food nutrients so still back for the waistline! Will do more research on this area and post on this! Thanks! Being a teen, it’s hard to be moderate, and poise and calm! (although I relatively am comparing to others my age). But will do! Very well articulated Priya, the hardest bit is to follow it 😦 But like how you gave us a day challenge in the other post, I tell myself: Just one more day off sweets and junk, in hope, that it eventually becomes my routine! Thanks Namrata! I was reading an article about mini-habits today which says that you need to start with really really small goals for each day and I think it’s a good way to fool ourselves into getting into good habits for the long term!